Your caption took me a minute, since I’m not really a fan of ballet, but this does look very much like a toe shoe! Maybe I should have mentioned a toe shoe in my text. The truth is I’m usually more inclined to think of tofu than a toe shoe. I got it instantly! What a find! What a great artist’s eye you have! It seems you got it much sooner than I did. Occasionally when I photograph something I’m aware that it looks like something else, but in this case the resemblance dawned on me only today as I looked through my archive from 14 months ago. I don’t remember noticing the resemblance last year, but when I looked at my archive today the likeness was ineluctable. You and Steve Gingold and Tom Whelan have posted so many crystalline pictures recently that I figured I had to do contribute something. While Austin dropped slightly below freezing this morning, I checked the frostweed and found no activity, so last year’s archive filled in for the lack of anything current. According to the local television news, noticeably colder in Fredericksburg than here. Have you seen any frozen water there? None here so far. The forecast for tomorrow’s early morning is 28°, which still isn’t cold enough and won’t last long enough for ice. That’s why I reviewed my ice pictures from a cold spell we had last year. Well, it’s definitely not as cold as my preferred weather service [Weather Underground] says for the station closest to our place, and it’s not freezing just now, but the night was very cold, especially with a strong Northerner. The water in our bird bath is still frozen solid, and there’s a good layer of ice in the water trough for the deer. Then if you’re so inclined you might get some good pictures of ice formations. I wish I had that opportunity. There’s certainly the pull of staying inside where it’s comfortable and cozy. Truly does look like an ice sculpture of a ballet slipper. So much color in one icicle. I think there was no intrinsic color in the ice but it picked up colors from the limestone overhang nearby. You’ve made wonder whether an ice sculptor has ever made something like what nature provided here. I took some macro pictures of icicles last year and it was amazing to see partially melted snowflakes in them. Can you point us to any pictures of that that you posted? I didn’t post them on here. I will have to search for them and upload as a new post, then I will notify you. 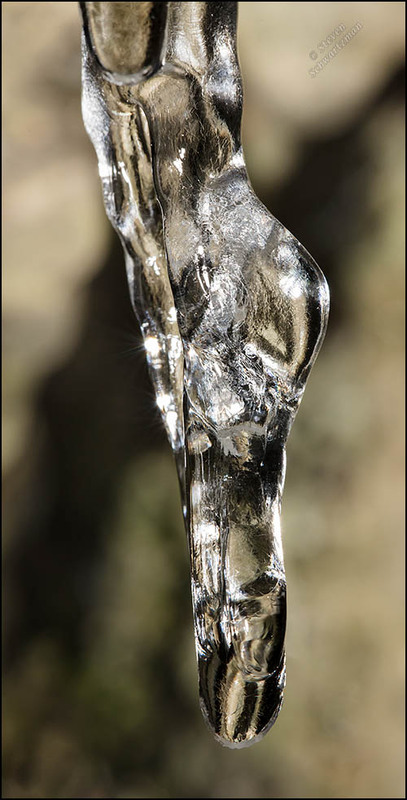 I have posted a pic of the icicle with snowflakes in it on my page. It’s the heel that makes this resemble a toe shoe. Lovely light and glistening appearance to the ice. So you’re saying this is a well heeled ice formation. Last winter’s brief cold spell provided a rare chance to do ice pictures like you northern photographers. Thanks, this is delightful.. I recognised the ballet term in your title and was stunned to see your photo.. perfect match! You’re welcome. I wonder how often icicles end up looking like this. I don’t recall ever seeing another one. Perfectly poised for the role of the Snow Queen. Somehow that story by Hans Christian Andersen seems to have escaped me all these years. I don’t remember it being a big part of my childhood. I learned other fairy tales, but apparently just by chance not that one. I knew what to look for because of your title, but I was surprised to see how perfectly the ice resembled a dancer en pointe. It might have been sculpted. On the other hand, the internal structure of the ice resembles the muscles and tendons of an extended leg, and I don’t think a sculptor could have created that. It’s a wonderful photo. It was the seeming musculature beyond just overall shape that clinched it for me. I believe you’re right that a sculptor wouldn’t have thought to create that. My one wish is that I could have had a background without that dark diagonal, but icicles form where they form and I couldn’t do anything about it. And I was just hung up on the idea of ice in Texas. Rumor has it we are going to have spring after all, up here. Birds are arriving! Maybe we’ll even make it into the teens today…. We got the cold weather but no ice or snow to make two overnight freezes in a row worthwhile artistically. That’s why I had to dig back into last year’s archive for this icicle. I’m sorry to hear that up in your neck of the woods today even the teens are iffy. Still, I think the rumor you’ve heard is true. Have you ever been to Mississippi? I have found a charming little town there that has sweet cottages for very affordable prices. I shall have to drive down there in August to see whether I can handle the other extreme, of heat. Texas is beautiful but I need more water. I’ve driven across the Mississippi Gulf Coast several times but haven’t spent much time there. I didn’t know you were interested in it. Texas also has a long coastline and of course that means plenty of water. You might look up the Padre Island National Seashore. Linda can tell you much more about the Texas coast. Thanks. The world of words found me before photography did, and I’ve kept up with both. When will the other toe-shoe drop? That’s an awfully nice Texan icicle.